Our home: Our house was built in 1946, but in 2005 we gutted it and added a second story. We have three bedrooms located on the second floor. The master has a connected bath and a balcony with a view of downtown. We also have a TV room and computer room on the 1st floor along with the living space and a recently finished basement that serves as an entertainment center. 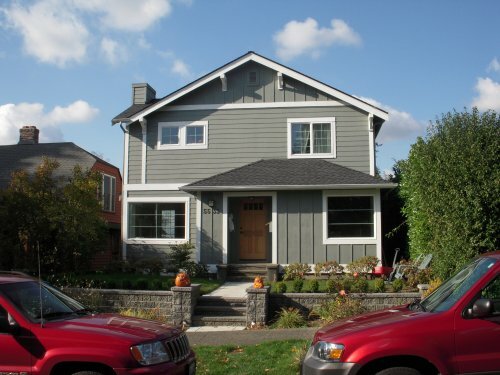 Our neighborhood: We are located in an older established area that is very close to the University of Washington. We are about 10 minutes from downtown and a half block from major bus lines. We are also walking distance from the University Village which is filled with shopping and restaurants. We have a grade school a half a block away with a playground and three other parks within walkign distance. About us: My husband and I are both high school teachers and avid travelers. We have two children, ages four and seven. We are open to offers although are pretty limited to summer travel.